Flower Fairy Tales of the Language of Flowers are taken from The Flowers Personified (1847), a strange, delightful book. It tells the stories of the flowers' lives after The Flower Fairy allowed them to become human. The Flower Fairy was displeased that the flowers wanted to leave her to become human. Their tales, for the most part, are not happy. 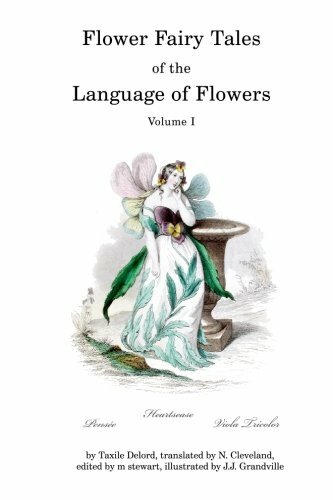 Volume I includes: "The Flower Fairy"-which tells why the flowers wanted to become human; "How The Poet Jacobus Supposed He Had Found A Subject For An Epic Poem: A Summary Of Everything Which The Ancients And Moderns Have Written on the Language of Flowers", including a list of flower names in English, French and Latin with their meaning; and a bonus listing of alphabetical Flower Meanings. The Language of Flowers, an ancient language, is just as subject to misinterpretation and error as any other language. Different cultures have used it throughout history. Flowers and other plants were assigned meanings that people familiar with The Language of Flowers could "read" by knowing the sentiment symbolized by the plant. The combination of flowers in a bouquet and the way they were worn or given to each other held meaning. Hours of the day ("Flora's Clock"), days of the week ("The Floral Week") and the months of the year ("The Calendar of Flora") were also assigned a flower meaning. Coded messages could be exchanged and secret meetings arranged, if you knew the language. There are many Language of Flowers "dictionaries" and they do not all agree on what each flower means. A great resource for baby names, pet names, character names and web IDs. If you have any questions about this product by Brand: earthly pursuits, contact us by completing and submitting the form below. If you are looking for a specif part number, please include it with your message.